No records were broken but at least I went! | It's Time To Start Running! No records were broken but at least I went! I should have titled this post running while thinking about running shoes. Skipping the boring bit about why I don’t have my running shoes, I had to go in ‘normal’ trainers. What a difference! It was much harder work and definitely more jarring. Some am glad I plumped for what I considered expensive running shoes, they are definitely worth it. So much more cushioning and support, at this rate I could turn into a shoe nerd. 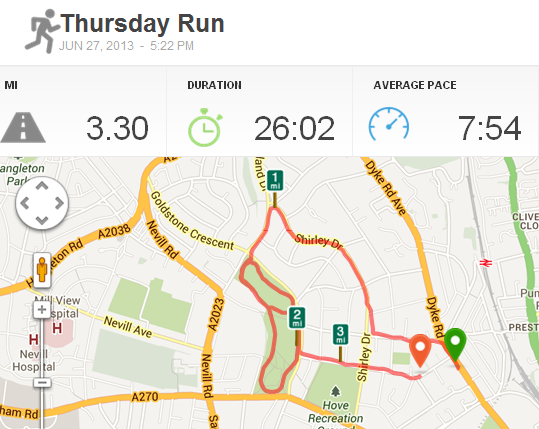 So today’s run was a tough 3.3 miles in 26.02 minutes at an average pace of 7.5 mph. It was down and round a park which was nice and definitely worth remembering as was the long drawn out hill back which almost finished me off. Hove Park is a nice place to run, I’m not sure how far it is to go round and there are too many dogs for my liking but a lovely green space to run, considering it’s in the centre of town. I also could have called this post running whilst thinking about running but I/he already used that one up 🙂 I was going to do my long run (one planned each week) on Sunday as usual, but then I realised I am going to a party on Saturday, add the fact there is an F1 race and MotoGP race on Sunday then its a no brained. Saturday it is. So now to think of a good route….